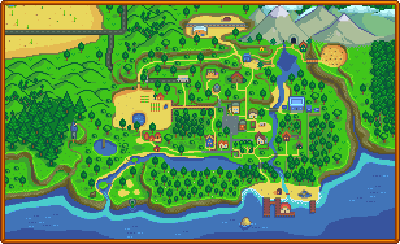 The Traveling Cart is a shop that appears south of The Farm, in Cindersap Forest, on Fridays and Sundays. It also appears each day of the Night Market (Winter 15-17). The cart is pulled by a pig wearing a fez and spectacles. If you interact with the pig, it oinks at you. If you hold the right mouse button the pig oinks a melody. During the Night Market, the pig floats behind the cart in an inner tube. The merchant sells a selection of random items in limited quantities (1 or 5 of each). Items are sometimes found for sale outside their normal seasons, which can be helpful for completing bundles. Traveling Cart prices may vary from visit to visit, and it is possible for the same item to be listed multiple times at different prices in the same visit. Prices are usually quite inflated, but you may find an item sold for less than its normal price. The Merchant's stock consists of 10 items plus one piece of furniture. There may be an additional "special stock" item for sale as well. 2.7 Crafting, Monster Loot, & Misc. Note that the Coffee Bean and Rare Seed may also be sold during any season as Standard Stock (1.26% chance of appearing). 10% chance for 5 stacks; 90% chance for 1 stack. Rarecrow (4 of 8) 4,000g Fall / Winter 40% chance to appear. Coffee Bean 2,500g All 25% chance to appear. Wedding Ring Recipe 500g All Multiplayer only: 100% chance to appear until purchased. Crafting, Monster Loot, & Misc. Each piece of Furniture shown below has a 0.68% chance of appearing in the Traveling Cart standard stock. The price for each will be between 250-2,500g. Furniture not shown is not sold at the Traveling Cart. 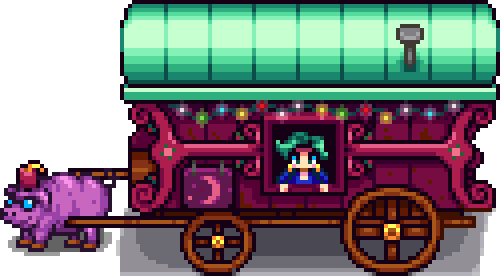 Players with access to their saved game files may find the "Stardew Predictor" utility helpful for predicting which items the Traveling Cart will offer each week, and during the Night Market. The utility is located at https://mouseypounds.github.io/stardew-predictor/. 1.1: Added Coffee Bean for purchase. 1.3: Added appearance at Night Market. This page was last modified on 14 April 2019, at 09:27.